I am honored today to share with you an essay written by my fourth cousin, once removed, Jennifer Spier-Stern. Jennifer is the great-granddaughter of Minna Ruelf and Isaak Spier, about whom I wrote in my last post. When Jennifer shared this essay with me, I was so moved that I asked her if I could post it on my blog. She graciously agreed to let me do that, and I hope that you also will feel the way I did—that I was with Jennifer in her footsteps as she walked in the footsteps of her family in Rauischholzhausen, Germany. I was transformed back in time as we drove through the narrow streets of the town called Rauischholzhausen. We passed old homes with beautiful flower baskets hanging from windows and well manicured gardens. The narrow street was paved and there was even a sidewalk. I wanted to absorb every corner, every home into my mind so I could never forget these images. I know that 70+ years ago it was not as pristine. I have thought of this day for so many months. Each and every time I envisioned this part of my trip I cried. The tears were for the people that were no longer here to tell me their tales. My father wasn’t with me to show me the way, to tell me about his memories and to stand with me in front of the home where he was born. To walk with me to the Schloss (castle) and show me the places where he ran, where he played, to show me where his family lived and where the synagogue was. The reason for this trip started many years ago. My father was born in Rauischholzhausen in 1922, a small town a few minutes drive from Marburg. 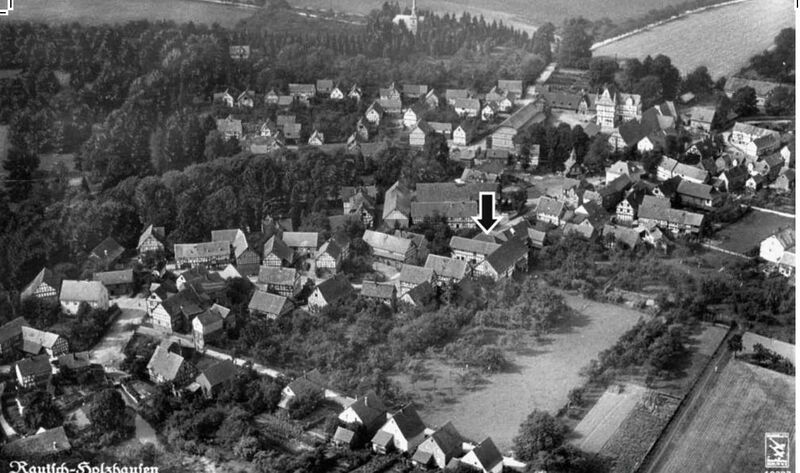 Growing up we heard all the stories of Holzhausen and of the early childhood of my father and his four siblings. We used to roll our eyes and laugh with yet another story of “home.” As young adolescents we didn’t appreciate all that he told us. I wish I had documented everything, but like most young adults, I didn’t. My father always promised my brother and I a trip back to his roots, but that was never going to happen, he passed away in 1998. Since my father’s passing I had fleeting thoughts of going to Germany but not until recently did this strong urge possess me that I had to go and see for myself. Without going into full details of the history of our family, my father’s brother returned to Germany with his wife and son and settled in Bielefeld in 1959. My aunt, uncle, cousin and his wife met us at our beautiful hotel and drove us to the house that was 16 Lerchengasse. 16 Lerchengasse was the house where my father lived. The house that bore the name I Spier (Isaak Spier) above the front door frame. We parked the car and walked that last few steps down a cul de sac. 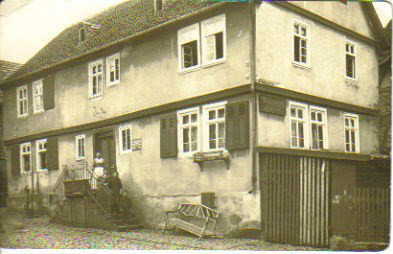 I had the vision of the house from few photos that survived the war. The next stop was the Jewish cemetery. We picked up the key at the caretaker and then we walked the grass soaked path towards the cemetery. The rain started and the path became very muddy. The land to the right was a beautiful pasture for grazing cows who seemed very curious and walked over to the fence. It seemed surreal. As we walked my eyes were looking down at the path, knowing that my grandparents and many other ancestors walked here to enter the cemetery. They came here to bury. They came here on the holidays to remember those that passed. They came here to say Kaddish. I was walking in their footsteps. 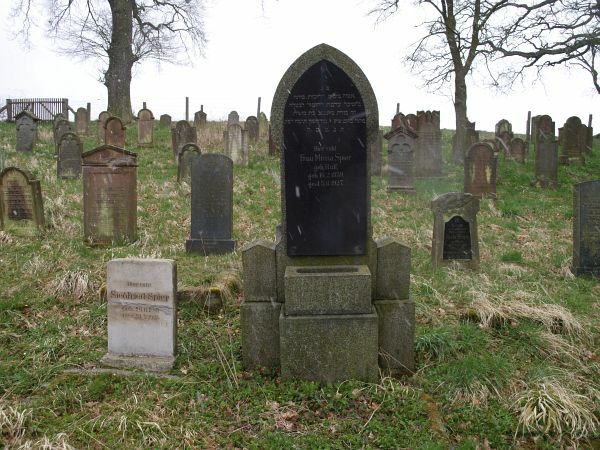 My grandfather Abraham Spier buried his parents, Isaak Spier and Minna Rülf neé Spier. One of the oldest stones in the cemetery is Nathan Spier, my 3rd great grandfather (1792-1866). We stepped into the cemetery where 80% of the graves are family ancestors. I had my dear friend Hajo Bewernick photograph every stone for me. I’ve looked at the photos numerous times and now, I stood before them. I stood there and cried. Emotions flooded my body that I didn’t know how to react. I wanted to touch every stone and place a rock, I wanted to pray. In years to come how many will walk through the gates to pray for all the souls? However, all I could do was cry. Later on I found out that my husband said the Mourner’s Kaddish, (a Mourner’s Prayer) as he stood over one grave, but he said it for all. I walked in their footsteps. I was thankful that my family who live in Germany were able to share this experience with me. Special thanks to Hajo Bewernick who took the time from his busy work and home life to show my husband and I Marburg. I can never thank you enough for explaining the history of your beautiful town as well as showing us the many historical sites and to our many insightfully deep conversations. You created a three dimensional image for me of my grandparents, my Oma and Opa, by showing us where they would have been, where they would have walked and the buildings from where they were deported. I do not recall the name of the street corner. Hajo was specific in pointing his finger. Through my research I have come across generous people who devote their time and efforts to the history of the Jewish people. To everyone we thank you for all your hard work. Special thank you to Barbara Greve for always being there with the answers. One more person I need to thank with all my heart is my husband, Effy. This trip wouldn’t have happened without him. He knew how important this trip was for me and I am glad he shared it by my side. I never felt closer to my family and my ancestors as I have during these few days in my family’s home town. I know I’ll keep these stories alive with my family and I hope they will continue the legacy. This entry was posted in Genealogy, Germany, Holocaust, Katzenstein, Reflections, Travel and tagged Germany, holocaust, katzenstein, Rauischholzhausen, Ruelf, Spier by Amy. Bookmark the permalink. You have started my work week once again with a renewed love and determination to bring my families stories alive. What a emotional start to my day. Please thank Jennifer for this essay for me. I felt like I was there with her…it was wonderful! That’s just how I felt—like I was there with her—with all the anticipation, emotion, and excitement. I’m so glad you shared this. I’m still haunted by that last post of yours. It just makes this one that much more emotional! I agree—that’s why I wanted to publish it after telling the family’s story. Thanks, Katie. I think what Jennifer experienced is a very complex variety of emotions. There is happiness, discovery, regret and a sense of time passing. When one is young there is never, or only rarely, a thought given to the time when the elders will no longer dwell with us in this world. It is very easy to take for granted their stories, memories and loving instruction so often repeated. Don’t I know it? How I wish I had asked more questions of my grandmother and my aunt when they were alive. What a lovely narrative – I was almost there with her. How fortunate She was able to makethe journey and that the house survived the war. Thanks for sharing. That’s how I felt—like I was there with her. Thank you for reading! I had that same reaction upon visiting my great-grandfather’s grave. He died long before his wife, and she’d remarried. His wife and all his children are buried in a different cemetery. He is all alone, and when I visited, I figured no one had been there for probably at least 40 years (he died in 1941, and his last surviving child died in 1975, my grandmother). It made me so sad. I put a stone on his stone (a Jewish tradition) and rubbed the stone as if I was somehow comforting him. I was so sad. I felt that way also, Karen. Such a strange sensation to feel so connected to someone you never knew. We cry for what was, what could have been, and what we were able to achieve. Thank you for reading. We are looking forward to seeing you soon. Have an easy and meaningful fast. Lovely post, Amy. I found her account of her time in the cemetery especially moving. I did also, Amberly. Thanks. Amy, I hope you realize the many doors you have opened in so many hearts. Yasher Koach! May the New Year bring more fascinating information as well as Good Health and Peace. Jennifer’s story is wonderful and moving. She’s set a good example for her family and future generations to continue the legacy. What a wonderful writing style. I agree on all counts. I’ve told her to write more! What an emotional journey, and I was there with her the whole way. And then I have such conflicting feelings about the idea of her uncle going back in 1959 and settling in Germany. Well, his wife had family in Germany (they were not Jewish so had not been persecuted) and wanted to go home. I can understand that. Sort of. But after knowing what had happened, I don’t know. But I am not in that position . . . . Right. I have learned that I’ve no idea what it’s like to have experienced these things.